We live in an age overflowing with information, and most of this is taking place in social media feeds and timelines. Social media is truly a window to the entire world, but it can be detrimental to your business if your employees are just messing about with hashtags, tweets, and likes all day. Annual social media policy reviews can give you and your business some much-needed clarity. Do you remember Chipotle’s social media debacle in 2015? It lost a lawsuit for firing an employee that posted negative content on social media because it turned out that Chipotle’s social media policy violated federal labor laws. That’s why you should work with your legal team to keep your policies up to date: so they comply with the Federal Trade Commission and the National Labor Relations Board. Social media policies can actually help safeguard sensitive data from hackers and cyber attacks, especially in a bring-your-own-device (BYOD) working environment. Employees must know the proprietary company information that must never be shared, as well as understand that confidential information — such as marketing tactics, non-public financials, and future product launches — are to be communicated only ‘internally.’ A good example is General Motor’s social media policy, which clearly spells out what can and can’t be disclosed to the public. Although posting offensive or insensitive material on a company-branded social media page being is an obvious no-no, it still happens. For the people handling your company’s social media, what precautionary mechanisms are in place to avoid a public relations disaster? Are there rules for different platforms? Beyond that, however, is a lot of gray area when it comes to if and how employees will be held accountable for what they post on their personal profiles. 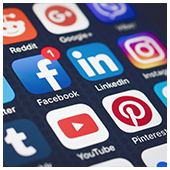 When social media policies clearly outline how employees should behave online and the punishments that come with violating that agreement, you can deter rogue employee posts and avoid a viral fiasco. Effective social media policies need to be fluid and responsive to the fast-paced modern business environment. Taking the time out to perform yearly social media policy reviews will save your employees a lot of confusion while helping your company steer clear of potential PR and legal nightmares. If you have further questions, don’t hesitate to send us an email or give us a call!